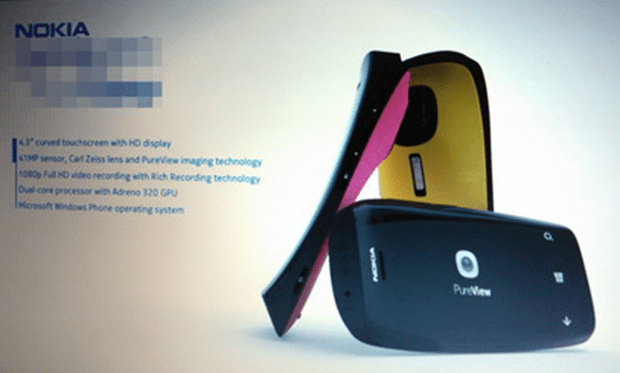 UPDATE: TheVerge confirms that there is a Nokia Lumia EOS that has a similar sensor to the Nokia 808 PureView. Nokia EOS will be the higher range of Lumia, built in aluminium. The edges will be square. AT&T will have the handset later this year. Tablet due 2013, presented Q1, contrary to source below. As MWC looms, expectations of Nokia’s new products begin to bubble into rumours. Here’s three of the rumours, from someone supposedly reliable called “Flavio”. A Nokia Lumia 920 with 41MP camera. This could be a load of hot air but nothing completely left field (Not as much as hearing rumours about a 41MP camera in a PHONE over a year ago anyway :p). At the Nokia 808 PureView launch, we heard that if Nokia waited to put PureView pro in Lumia, they’d be delayed a year. Well, one year on, it’s quite right for users to expect the 41MP PureView (along with mahoosive sensor) to appear in a Lumia. We already some some supposed leaked images (quite weird ones at that). BTW, when was the new Windows Phone logo announced? I looked back at sources and it said August 2012. But this picture was available in April? (Unless they just assumed it would be identical to W8 logo). To have a hump or not have a hump? If the rest of the phone is slim enough, and the camera blows away the competition like the 808, then for some people who want the best of the best in imaging (like 808 users) can handle that bit of extra bulge. It might not be for the peeps who want anorexic phones, but hopefully Nokia will have another product to cater for their slim needs. Cheers Il Principo for the tip!